Labels: Recipes Posted by Yann_Chef on at 10:44 a.m. 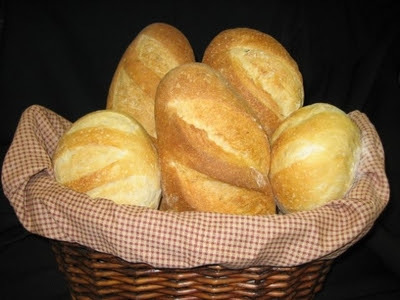 This recipe is the basic white bread recipe that I use in the restaurant. It is a classic French, yeast, white bread. It can be shaped and flavoured to your liking with sun dried tomatoes, pesto, etc. Mix the flour and the salt (add your flavouring at this point). Dissolve the yeast in half of the water. Place the flour in a mixer (type Kenwood chef), set on slow and slowly add the water/ yeast mixture. Add the rest of the water slowly until the dough reaches a soft, moist texture. You may not need all the water as the flour does not behave the same way if the weather is dry or humid. Set you food mixer on fast for 5 minutes then on slow for another 10 minutes. At this point, the gluten matrix forms and the starch absorb the moisture and solidify the gluten matrix by filling the gaps in the gluten web of protein. Place your dough in a warm place, covered with a clean kitchen cloth. Let it proof for 1 hour. The fermentation process takes place. The yeasts feed on the glucose component, of the starch and generate some CO2. The dough rises and doubles in size. Put the dough in a the mixer and set it on a medium speed for 6 minutes. On a clean and floured surface knead the dough by hand for 10 minutes. Dive it in two parts of equal size. Shape your bread to your liking. Place your bread on a baking tray leaving some space for the to rise again. Score the bread. Set a side to proof for 1/2 hour in a warm place. This is the final fermentation process, more CO2 is produced as well as some alcohol type molecule that will kill the yeast in the bread. Preheat your oven on high heat (230 degrees Centigrade) and place a container of water in it. Sprinkle some flour on the bread put in the oven for about 40 minutes. After 10 minutes set your oven to 160 degrees Centigrade. The first part of the of the cooking process will create the crust and the flavour of the bread by the browning reaction or "Maillard reaction". The very same chemical reactions that happen when you roast meat. The second part of the cooking process set the starch/ protein walls around the bubbles of CO2. Leave the bread to cool on a pastry rack. "Great eaters and great sleepers are incapable of anything else that is great." Why Almonds Don't Taste Like Almond Flavouring?